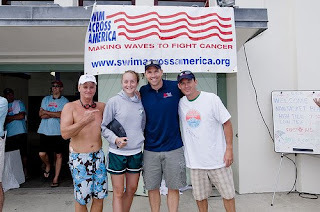 This summer Bates Swimmers and Divers helped raise money for Swim Across America (SAA). SAA is dedicated to raising money and awareness for cancer research, prevention and treatment through swimming related events. This year nearly all NESCAC Schools participated in the event and, most importantly, the NESCAC TEAMS RAISED OVER $60,000 FOR SAA! In our first year, Bates raised nearly $2,500 (Lipoff leading the way with $1,750!)... We look forward to helping out more in the years to come. Congratulations, and THANK YOU to all that gave to this great event. Also, check out freshman Abigail Hanson below. She was brave enough to jump in the cold water that afternoon, and ended up 69th out of over 150 people!